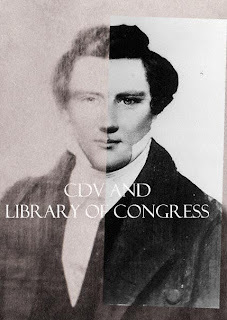 I must admit that up until a few weeks ago I never knew that there was even a controversy over the photo of Joseph Smith Jr. which is owned by the Library of Congress. Maybe I should first start by explaining where this crazy journey began for me. About twelve years ago while visiting my grandmother, the conversation of genealogy came up. She handed me a book of various copied journal accounts of some of our pioneer ancestors. I found looking through it very fascinating and intriguing, then I turned to a rather odd page. There were yellow newspaper images and a few small stories about the LDS Prophet Joseph Smith Jr. In the corner on the page sealed under a small plastic cover sat a photo. The thin silver gray photo was matted on a slightly larger piece of card stock and had been well preserved. Written underneath this photo were the words "Copy of the Original Tintype". I asked my grandmother about the curious photo. She explained that it was a photo of Joseph Smith Jr. and that she had received it many years prior. It was her belief that during a photo session possibly by Lucien Foster that two photos were taken. I believe that she said the LDS Church had one of them and that the other belonged to a non-LDS man. Looking back now I realize that my dear grandmother may have been mistaken. Not about the image in the photo but about whether anyone else was in possession of this or any other actual unedited image copied from a daguerreotype picture of the Prophet. Attempting to learn the truth I contacted the LDS Historical Library a couple of weeks ago. I told them of the carte-de-viste photo and what I believed it to be. Being hesitant to send the entire image digitally, I sent a sliced version done in Photoshop. A couple days later I received an email . 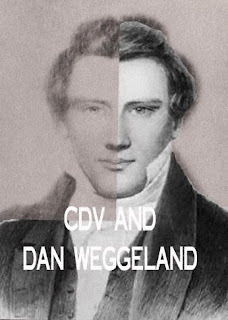 It was their belief that what I had was a carte de viste of a sketch done by the Utah artist Danquart Weggeland. Being an artist myself this did not sit well with me. I found what picture I believed they were talking about and did a digital comparison in Photoshop. I found that the lines of the drawing did not match at all or the style of hair for that matter. For further comparison I used the image from the Library of Congress. I noticed that indeed the two images matched except for some artistic editing and enhancement work that had clearly been done. I noted that the artist had done some painted work on Joseph's eyes especially his left eye (pictured on the right side of the photo). Perhaps it was done to balance his face and make it appear not so uneven. The artist also cleaned the lines of his jacket for a more tailored look and touched up areas of the photo that appeared to be overexposed. I believe in doing this, they changed the true nature of his face and overall appearance. Having done portrait work for many years I know that it is the most of minor details that create the true likeness. Now again the true nature of the Library of Congress photo comes into play. Some believe it is just a reproduction of the painting owned by the RLDS Church and possibly painted by the artist named Majors. I thought in that instance I would do some comparisons. First I compared one of just the left eye from my photo, the Library of Congress photo and a picture of the RLDS painting (in that order from the bottom up). Notice the middle picture has an over exaggerated iris and the pupil appears to be slightly off center. I believe this is the work of a photo editing artist. The lower lid has an unnatural plunge to compensate for the exaggeration. The lines of the upper lid remain the same although darkened. The top eye is from the RLDS painting and the iris appears to be more in proportion as well as the lower lid. The upper lid however, has been given a different square-like appearance, especially on the outside corner. The second comparison of the RLDS painting and my photo show that the entire jacket outline has been changed and lowered. This again is the work of an artist to create more symmetry and elongate the painting. It appears that the original daguerreotype may have been used as a reference for the RLDS painting. The Library of Congress photo appears to be a post edited version of the photo I was given. I am again waiting to hear back from the LDS Church History Library as far as the information they have acquired. I will post more later when information becomes available. Please note: The image header on my blog is copyrighted by me, the artist. Astounding! I was sceptical at first, but count me in the believers' camp. This is quite obviously a photograph. Very exciting stuff! Am looking forward to more updates! I was privileged to see the actual photograph with my own eyes just a few days ago. The research and evidence that has been presented on this blog about it is quite compelling. Moreover, I believe it to be true. I look forward to the authentication process being completed for this remarkable photo. 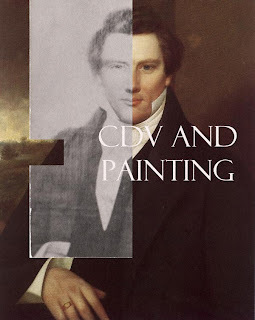 It will mean so much to many people throughout the world who love and revere the prophet Joseph Smith, to truly know what he truly looked like! I'm about to say something that may upset you. You compared your "photo" with the Library of Congress version, right? And the lines line up exactly, right? Well the L. of C. image is not a true photo of Joseph Smith. To speak to me more about this e-mail me at sam.mastersamy@gmail.com. I had no idea that there was a photograph of Joseph Smith. I was actually just talking about this with my grandpa the other day. We were watching a DVD produced by the church and there were a bunch of paintings of Joseph Smith. He made the comment that there always seem to be paintings, but no photos. I guess here's my proof that we were wrong.